Well folks, that was fast. Another regular season has come and gone. Frankly, I’m glad to see this one go because it goes without saying that in this rebuilding year, Miami (15-16-3) was about as mediocre as it gets. Now, that’s not to say this season wasn’t exciting. As we wrote a few weeks back, a movie could have most definitely be made about the season. Consider the drama…a senior goaltender being summarily dispatched after an on-ice incident. A horrible first half of the season made mediocre with a solid second half. A senior captain, burdened by the ‘C’ struggling to regain his form. A Miami team that faces a formidable foe this weekend struggling to keep its NCAA Tournament hopes afloat. This weekend, Miami has to find a way to win two of three games against a squad they have not beaten this season. Though Miami is 1-0 all-time (in Minnesota even) against Minnesota-Duluth (15-14-5) in the postseason, the RedHawks went 0-3-1 against them this season including dropping two in suffering an awful sweep last weekend when they were playing to host this series in Oxford. The RedHawks were outscored 8-1 and were never really in either game. Jay Williams was pulled on Friday and the team didn’t play well in front of him either night. On the bright side, freshman netminder Evan McCarthy saw his first collegiate action in the Miami net – so there’s that. If Miami cannot rally this weekend, and frankly next (in all likelihood, they’re going to have defend their NCHC Frozen Faceoff title in order to qualify for the NCAA Tournament), it will mean that Miami will have missed the Tournament in two of the past three years. What’s worse is that like in the 2013-14 season, they were supposed to host one of the regional brackets in, yep, Cincinnati. At some point, you begin to wonder if this program has plateaued? Have we seen all that it has to give? But that’s something we’ll consider in greater depth if the team fails to advance this weekend or next. Duluth is built from the net out led by sophomore netminder Kasimir Kaskisuo who merely led the conference with a 1.69 GAA in conference play while ranking second with a .932 save percentage. The Bulldogs are also blessed with four solid defenders including Willie Raskob, Neal Pionk, Carson Soucy and Andy Welinski who make it hard on opposing forwards in front of Kaskisuo. Up front, UMD has a stable of solid forwards including Kyle Osterberg, Dominic Toninato, Alex Iafallo and Karson Kuhlman. It’s a deep roster that maybe won’t wow you with statistics, but one that has a threat on every line. It will be a challenge for Miami to contain UMD, something they obviously did not do last weekend. But, I told our friend and UMD PXP man Bruce Ciskie before last weekend that I felt whichever squad won last weekend’s series, and as such home ice, would lose the following weekend when it really counts – at least for Miami. And, as we wrote after last weekend’s sweep, Miami has over the past few seasons, found a way to make a run through the NCHC Tournament reaching the championship game in the league’s first two seasons of existence. Two years ago they went on the road after finishing dead last in the regular season and upset Penrose Cup champ St. Cloud in Minnesota and defeated North Dakota in Minneapolis before falling by a goal to Denver in the title game. That Miami squad also needed to capture the Frozen Faceoff title to advance to the NCAA Tournament. Last season, Miami finished second in the regular season and then breezed to a Frozen Faceoff championship. In doing so, the RedHawks lost their top two goal scorers, Riley Barber and Blake Coleman to injury and suspension, respectively, in the title match against St. Cloud. One thing is certain, St. Cloud wants no part of Miami in this tournament. So, Miami can do this and they’re going to have to again. And, despite the record against UMD this year, I have a strange feeling they will find their way to Minneapolis again. And, the gang at USCHO sees this series as incredibly tough to pick as well. We’ll have more later, but it’s fairly easy to admit this is one of the worst Miami hockey weekends in recent memory. Consider CC entered the weekend with a 1-13 record having just notched their first win of the season last weekend against Air Force. But, this weekend they were the better club defeating Miami in a pair of one-goal games 2-1 and 3-2 giving the Tigers their first two league conquests of the 2015-16 season. I would be remiss if I did not mention that Miami was the better team tonight. They outshot the Tigers 36-23 but as I mentioned earlier this evening, they simply do not have enough finish whereas CC buried chances when they got them — especially on rushes. While Ryan McKay was good this weekend, he did not have a great weekend coming up with saves one-on-one. The best goaltenders do, but you can’t blame McKay for what transpired this weekend. You can make all the excuses you want to support the play of this team, but they did not get much help from the officials tonight who missed some blatant calls, especially one late in the third period in the offensive zone when Melnick was hauled down. That non-call lead directly to the game winner off a 2-on-1 rush with Hunter Fejes ultimately walking in alone to McKay’s left. And, it led to a rather heated exchange between Miami coaches Enrico Blasi, Brent Brekke and the hapless NCHC officiating pair of Brian Aaron and Todd Anderson as the teams left the playing surface. Overall, this is simply a rebuilding season for the RedHawks. They lack punch and we’re seeing that the Kuraly’s and Louis’ of the world simply aren’t what they were while playing with the Barber’s, Czarnik’s and Coleman’s of years past. To reflect for a moment, it’s really unfortunate those ultra-talented, but dysfunctional at times, Miami teams did not accomplish more in the NCAA tournament while those top-end guys were here. But, it is what it is. With the freshmen talent that’s getting valuable experience this year, Miami will be fine with the rock solid recruiting class that’s a year away. While I’m not saying, ok I’m saying, this season is lost, if we assume that Roslovic and Louis return for another year plus Melnick, Sherwood and Siroky, and what they’ll be bringing in, Miami should be primed to return to the top of the NCHC in a year or two. But, this team? This is not a good team and they will struggle to stay ahead of CC. Seventh place in the league is looking likely with only Western Michigan playing worse hockey than the RedHawks right now. The CC powerplay goal was just the 3rd PPG Miami has allowed this year. However, it may have come after a missed offside by the linesman. The officials reviewed the play but according to others in the press box, the angle was not conducive to overturning the on-ice call. Miami definitely misses a big time scoring touch this year. Guys are making smart plays and passes but there just isn’t enough finish out of the forwards. We have been used to seeing guys bury Grade A chances, but this year, it’s simply not happening — throughout the lineup. Miami could easily have four or five goals already. Miami has seemed to let up on both nights playing with the 1-0 lead. Gotta continue to play hard for that next goal. Obviously, entering the 3rd period tied means they need to get the next one to have a chance to win. Puck possession is something we are lacking. Typical Rico Blasi teams treat the puck like a prized possession, but this group is far more lax and is content to dump and chase. Again, we have less talent than we are used to, but guys have to be patient and know they have the ability to carry the puck into the zone. Whenever Louis, Melnick and Roslovic are on the ice together, you have to pay attention. Lots of skill and speed. Assuming they’re all back next year, this will be a terrific line. Time to get one and get home. 2-2 after two in the Springs. Quick first period thoughts from the press box here at World Arena. Sean Kuraly seems much more involved tonight as he has been skating the puck with confidence and gave a rousing fist pump after his first period goal, just his second of the season, that gave Miami the early 1-0 lead. Grant Hutton is a nice add to this team. The freshman is tied for fourth in the conference in blocked shots with 16 on the season and just looks like he belongs. Size, good head and seems to be in position. Conor Lemirande really looks good this weekend. Using his body and his reach to effectively win puck battles and is actively calling for the puck as he moves without it. Miami has made an adjustment to CC’s transition game on the big ice and is not surrendering the blueline as easily as they did last night when the Tigers skated through the neutral zone at will. At least in the first period, they made it much harder for CC to enter the offensive zone. Colin Sullivan was listed on an offensive line as a spot-filler only. Miami is rolling 7 defensemen tonight in an effort to give coach Enrico Blasi more options. Last night, the defensemen were fairly brutal, especially in the third period. Perhaps he could also be accounting for conditioning of his defensemen here at altitude. Overall, Miami carried the majority of the play with Jack Roslovic and Anthony Louis impressively carrying the puck at times and Sean Kuraly looking more disruptive with his speed. 1-0 Miami after one. Let’s add to the lead unlike last night and get out of here with a W.
With Pikes Peak as a backdrop, Miami takes on Colorado College this weekend. After a week off, Miami travels west this weekend to Colorado Springs, Colo. to face the hapless Tigers of Colorado College. The bye and trip to the mountains comes at a particularly good time for the RedHawks (5-7-2, 2-5-1-1, 6th NCHC) who play for the first time since tying and dropping an overtime match two weeks ago against 6th ranked Omaha in Oxford. Miami will not play again until after the holiday break when they open the second half of the season at home against RPI on January 2-3. Needless to say, this is a critically important NCHC series for Miami as they currently sit in 6th place having played at least two more league games than any other conference school. Conceivably, Miami could end the weekend as high as third place in the league with a sweep of CC (1-13, 0-6, 8th NCHC). Last weekend, the Tigers finally recorded their first W of the season defeating in-town rival Air Force at World Arena — the same venue where Miami swept the Tigers a season ago. CC’s top point producers Trey Bradley (5-3-8) and defenseman Teemu Kivihalme (2-5-7) are underclassmen and after having seen the Tigers in person a few weeks back in the Gold Pan series against Denver, it’s clear this is not a very talented team. 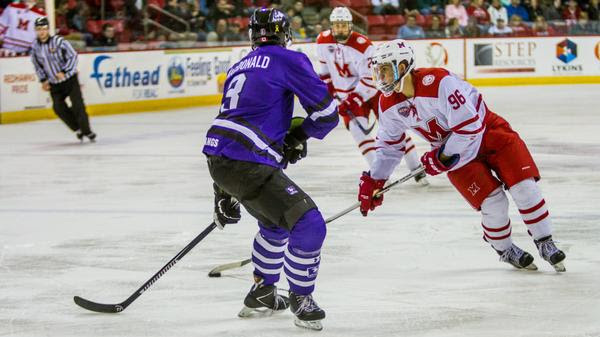 Head coach Mike Haviland has 14 freshmen on the roster and is still trying to fill the skates of defensemen Jaccob Slavin who left with two seasons of eligibility remaining to sign a pro contract in the offseason. In net, the Tigers have rotated between their two goaltenders frequently with Tyler Marble and Jacob Nehama splitting the first 14 games. Neither has impressive numbers with Marble sporting a pedestrian 3.65/.891 line and Nehama showing a grotesque 4.12/.885 line but he does have the Tigers lone win on the year. Last season, Miami swept CC in Colorado Springs by 3-1 and 2-1 scores. I do recall Miami looking tired on Saturday night playing on Olympic sized ice at 6,035 feet or 5,107 feet higher than Steve Cady Arena in Oxford. So, we’ll be watching to see how Miami handles the arid climate, high elevation, big ice and Mountain time zone this weekend. Overall, this should be an opportunity for Miami to make up some ground in the NCHC as they head into the holiday break. Anything less than six points this weekend would be unacceptable. I’ll be live Tweeting from World Arena this weekend, but you can find the game on the American Sports Network as well as NCHC.tv. Greg Waddell will have the Miami radio call this weekend across the Miami Sports Network. This weekend, Miami (2-1-1) heads out for a long road trip (they bussed this weekend so Waddell’s rear end will be sore) to Canton, New York to take on the Saints, of course, of St. Lawrence University (3-1-0). These two teams are no strangers as Miami returns the favor from last season when the Saints visited Oxford. The two teams split a pair of one-goal games last year with the Saints winning 5-4 on Friday before Miami earned a hard fought 2-1 win in OT on Saturday night. Last weekend, Miami swept duhOSU while the Saints split a pair of road games defeating New Hampshire 3-2 on Friday before falling to Merrimack 3-1 Saturday. for that as he single handedly carried the Saints, especially early in the season. Hayton set program records for in GAA (1.97), save percentage (.937) and shutouts (5) so obviously SLU is counting on him to maintain that form in 2015-16. At ECAC media day, SLU head coach Greg Carvel noted how important his goaltender was last season, especially early. Carvel added that he felt Hayton’s play helped cover up some of the mistakes made by SLU’s young team but he felt that changed as the season went along. “I think if we play as a team the way we are capable of, scoring chances should be way down,” he said. Top returning offensive threats for the Saints include MIke Marnell (11-6-17), Tommy Thompson (9-14-23) and Brian Ward (9-17-26) along with freshman Jacob Pritchard. So, it’s not exactly an offensive juggernaut but they will play tight defense and have some nice returning defensemen to assist in front of Hayton. victories in net last weekend as he is making an early play to seize control of the Miami net as Jay Williams was unimpressive in his only start of the year, a 7-3 drubbing at the hands of Providence on opening night. This is a LONG road trip for Miami, about 12 hours on the bus, and the first real roadie of the year. Miami will need to get production from its veterans this weekend to help the freshmen understand life on the road. I don’t feel great about the weekend, but I’ll pick a split in two tight 2-1 or 3-2 type games. Quick preview this weekend as #18 Miami (0-1-1) travels to take on duhOSU (0-2-0) tonight at Cheap Furniture Arena in Cowtown and hosts the Buckeyes tomorrow at beautiful Steve Cady Arena in Oxford. 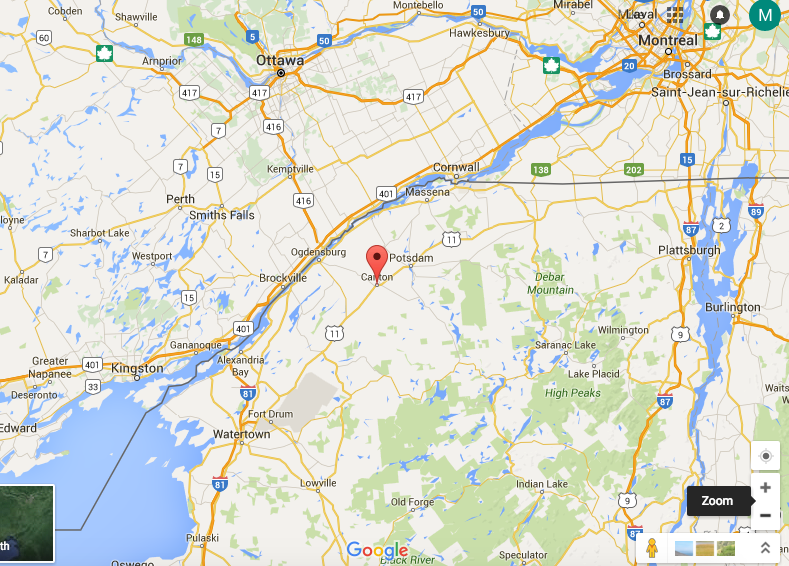 Game times are 7 PM EST tonight and 7:05 PM EST Saturday night. Last time out for Miami, it was an opening weekend against a familiar and formidable opponent as the defending national champion Providence Friars came to Oxford. Little was known about Miami’s youngsters but highly touted Jack Roslovic did not disappoint with a 1-1-2 line on the weekend while classmate Josh Melnick really impressed with his speed and all-around game also notching 1-1-2 including Miami’s first 3×3 OT goal in Saturday’s 2-2 tie. Senior Alex Gacek contributed four assists on the weekend as he and senior captain Sean Kuraly will be counted upon to lead the RedHawks offensively this season. For duhOSU, well they started by being swept by #10 Bowling Green including a shutout defeat on Saturday night. Really, there’s not much to say about Ohio State. They aren’t very good, and they play in a weak conference. But perhaps that could be a testament to how good BG is though they were routed 4-1 on Tuesday night in Kalamazoo by Western Michigan, a team that’s expected to compete for the basement of the uber competitive NCHC. 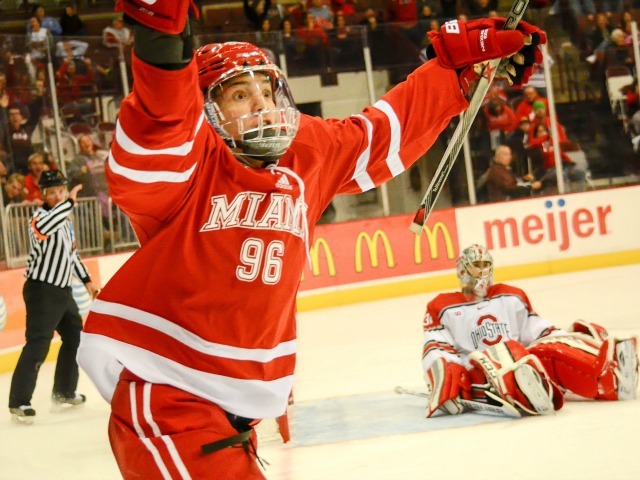 This weekend, MIami should get right and should sweep the Buckeyes in the now annual home-and-home series between the two former CCHA rivals. Expect the Miami fans to nearly outnumber duhOSU “fans” tonight. We expect to hear the sieve chant loud and proud! We’re back. And, we are the three best friends any Miami hockey fan could ever have as the Tremendous Trio of John, Mike and Doug will conspire to bring you even better coverage this year than in past years. But, more on that later. Enough of the offseason previews and fancy media day pressers. It’s time for the first weekly preview of the season and we couldn’t be happier. When we last saw you, Miami, minus it’s top two goal scorers, played a first round NCAA tournament game against eventual national champion, Providence. Well, those two goal scorers have since moved on, so once again, Miami will face Providence without its top two goal scorers from a season ago. For Miami, it was heartbreak as the RedHawks fought back from a 6-2 deficit to make it a 6-5 game on the strength of three extra-attacker goals. And, you really felt like Miami would find a way to tie the game. Alas, Providence finally found an empty-net goal and won the game 7-5 en route to the program’s first national championship. But, this is a new season and both squads will line up differently than they did in March. 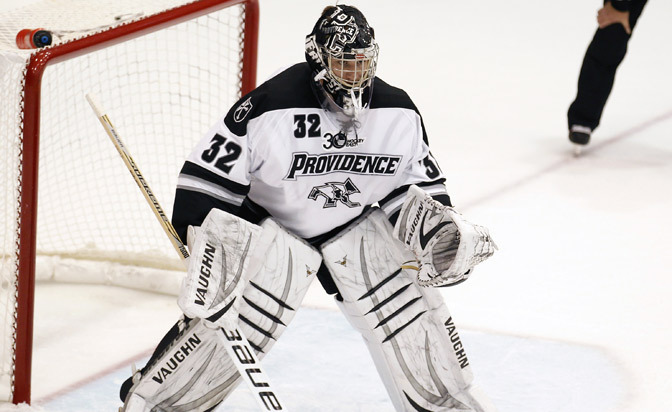 Last season’s Providence Friars were built from the net out as they relied heavily on their goaltender and an impressive group of blueliners. Lost among all that defense was a solid, if unspectacular, group of forwards with the talent to put enough pucks in nets. That squad engineered a four-game winning streak at precisely the right time that included victories over three consecutive NCHC squads — Miami, Denver and Omaha — en route to a championship win over fellow Hockey East foe Boston University. This season, Providence returns 19 letter-winners including a group of experienced forwards looking to end their college careers with back-to-back national titles including last season’s top scorer Nick Saracino (14-24-38) who contributed two assists in the win over Miami. In addition, Trevor Mingoia (15-16-31) and Brandon Tanev (10-13-23) who both contributed 1-1-2 in the 7-5 win return as do Mark Jankowski (8-19-27) and the top scorer from the blueline Tom Parisi (5-19-24). In short, the Friars are loaded with veteran talent looking to prove that last season’s improbable run to a national title was no fluke. 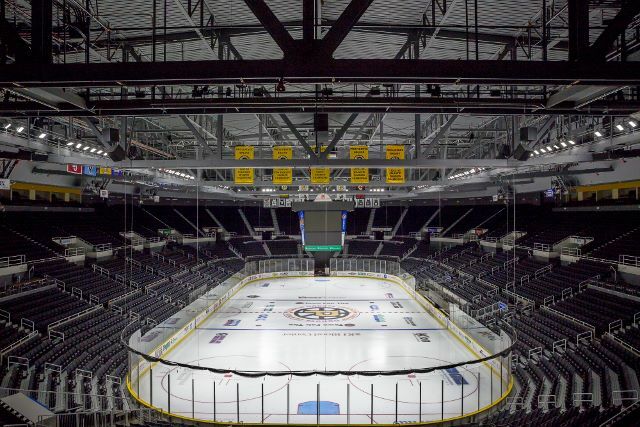 The only real question mark for Providence is in net where two juniors, Brendan Leahy and Nick Ellis, along with freshman Hayden Hawkey (I swear I did not make that up) will vie to fill the vacancy created by Gillies’ early departure. Last season, the two of them played a combined 193 minutes with Ellis getting 189 of them meaning the Friars are extremely inexperienced in net. It would seem that the race for the starting goaltender job is wide open. During his weekly press conference, Miami head coach Enrico Blasi talked about the challenge of facing the Friars. Considering the challenge in facing the defending national champions and the team that just ended your season, Miami senior netminder Jay Williams had this to say about the need for additional motivation for the season’s opening weekend. Predicted to finish third and sixth this season by USCHO writers Matthew Semisch and Candace Horgan respectively, and fifth by the media’s preseason poll, Miami enters the 2015-16 season looking to replace its top two goal scorers (Blake Coleman, Riley Barber) and its captain, Austin Czarnik from a squad that finished second in the NCHC and claimed the conference’s second-ever tournament championship on the strength of victories over Denver and St. Cloud en route to a #1 seed in the national tournament. In fact, Miami must replace five of its top nine scorers from a year ago. You can read more about Miami’s roster makeover from BOB’s John Lachmann here. carousel” as it’s anybody’s guess if one or the other will seize the bulk of the playing time. In fact, in last weekend’s opening 6-1 exhibition victory over Western Ontario, the two seniors split 60 minutes about as evenly as they possibly could with Williams surrendering the only goal against on the evening. This is a difficult series to pick because while we know Miami will be leaning on its defense and veteran goaltending, we simply do not know a lot about the newcomers and the lack of roster depth is concerning. That’s not to say there won’t be roster battles as there will be a few skaters sitting each weekend, but with only 24 skaters on the roster it’s more important than ever that the coaching staff dresses the right guys every night. Considering the emotional way Miami’s season ended a year ago, and the need to prove themselves early in the year, I’ll pick a split, but I wouldn’t be surprised to see Providence get a sweep as they return so much from last year’s title team. Both games can be heard via TuneIn Radio and seen via the NCHC.tv package. Greg Waddell (PxP) and Drew Davis (analysis) return to call all the action. • After NCHC teams went 6-1 in exhibition games last weekend (Omaha didn’t play), all eight NCHC teams open the 2015-16 regular season this weekend with non-conference games. Two series feature a pair of top-10 teams as No. 11/10 Miami hosts defending national champion and No. 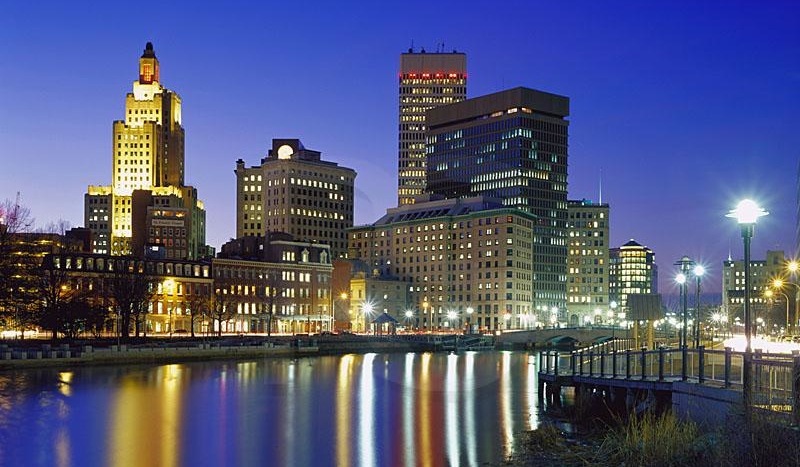 7/7 Providence for two games, while No. 10/11 Omaha travels to No. 6/9 Minnesota State for two games. The Friars eliminated Miami from the NCAA Tournament last season while the two Mavericks also opened last season against each other, splitting two games in Omaha. • Two other NCHC teams are traveling to opposite ends of the country to open the season at tournaments. No. 4/4 North Dakota drops the puck on 2015-16 at the Ice Breaker Tournament in Portland, Maine, while No. 17 St. Cloud State begins at the Kendall Hockey Classic in Anchorage, Alaska. UND officially begins the Brad Berry era on Friday as he begins his first season at the helm of his alma mater after nine seasons as an assistant coach at UND. He is the only new head coach in NCAA men’s hockey (D-I) this season. • St. Cloud State senior forward Kalle Kossila is the active career leader in points in the NCHC with 99 and sixth among active NCAA players. His 65 career assists are second among active NCAA players. • Omaha returns 91.4 percent of its goal-scoring from last season and 90.1 percent of its points from a year ago, both of which are the highest percentage of any NCAA team this season. • Omaha junior forward Austin Ortega, who set the NCAA single-season record with 11 game-winning goals last season, is the active NCAA leader in career game-winners with 12. Miami senior forward Sean Kuraly is tied for second among active players with 11 career game-winning tallies. • North Dakota senior forward Drake Caggiula has played in 123 career games, the most of any active NCAA player. Miami senior defenseman Matthew Caito and Denver seniors Nolan Zajac and Gabe Levin have all played in 119 career games, which is tied for third among active players. • NCHC teams have a combined 44 NHL Draft picks on their rosters. • In the NCHC Preseason Poll, Minnesota Duluth was picked as the favorite to capture the Penrose Cup, earning 17 of 30 first-place votes. UND, the defending Penrose Cup champions, Denver and Miami also received first-place votes in the poll.